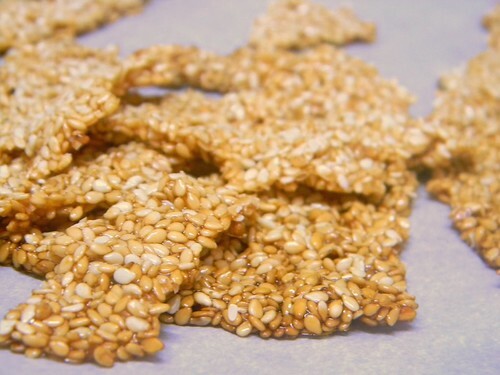 There’s nothing much to say about these sesame snaps. Requiring few ingredients, they’re very simple and very easy to make, and they’re done within a relatively short period of time. Soon after making, they’re quickly eaten up. In this batch’s case that you see here photographed, I ate most of it, perhaps three quarters. What can you do when it’s left out in the open? I pretty much started eating it after I took the photos. The ever-improving and expanding recipe index I’ve done the recipe index over again and improved it more. Once again, I re-organized it (in progress), adding some new categories that will hopefully aid in your navigation in addition to my labeling recipes either SCD and or GFCF. I had some issue with the nut-free category as far as coconut is concerned (coconut – nut, fruit, or seed?) but I rolled with the Canadian Food Inspection Agency‘s ruling out that coconut doesn’t currently fall under the category of tree nuts as most people with tree nut allergies can safely eat coconut. Note: if you only have roasted sesame seeds on hand, those work, too. 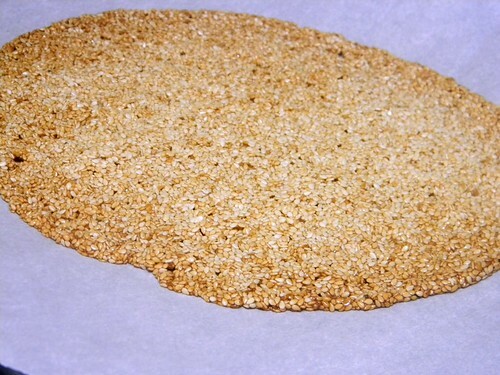 Preheat oven to 350ºF and line a baking or cookie sheet with parchment paper. Mix the sesame seeds, honey, salt, and coconut milk (if using) together in a bowl. 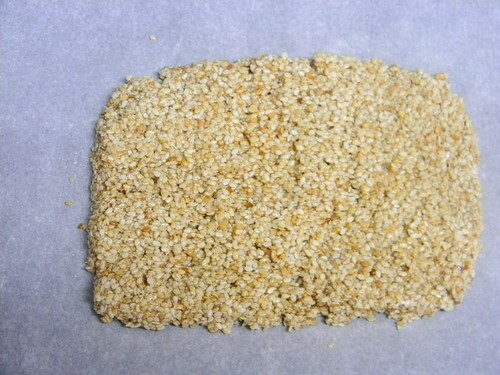 Spread with the back of a spatula on the prepared baking sheet and bake for 20 minutes or until you can smell the honey and sesame seeds, and golden brown in colour. As seen in the photos, it will spread. Remove from oven and cool, allowing to set. (To make the setting faster, you can put it in the freezer for about 5 to 7 minutes, until hardened.) Cut into squares or rectangles, or just break off in irregular shapes. They are soft and sticky, so be sure to have a piece of parchment or wax paper in the vessel you wish to serve or display them in. If you want them crunchier, stick back in the freezer for a few moments, long enough to harden but not become frozen. Enjoy! That looks simply heavenly! 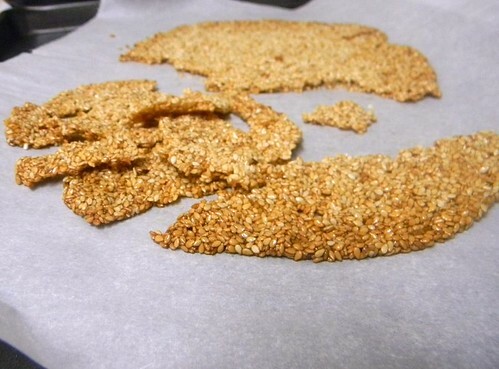 I saw a similar sesame candy recipe on AllergicGirl’s blog once. This looks amazingly like a gluten-free protein bar I ate in the airport on vacation. I plan to do a review of the product. Yours is better though … I can tell just by looking. And, yes, last photo is great! Mmm, thanks for all your work on your recipes and your recipe index, it’s such a treasure trove. Hate it when I eat what I’ve baked straight out of the oven. I mean, I virtually always do that, but when it all disappears too quickly…sigh. Always happens with nut parmesan :-). I must try these, should be better – oh, and cheaper, yay! – than store-bought. Hi Anne, thank you and welcome to Z’s Cup of Tea! Your comment has made me curious, what is nut Parmesan? It sounds intriguing. Hi Kaitlin, thank you! 🙂 Haha, yes, if it wasn’t for my thoughtful consideration of other family members who might want to have some as well, I would have otherwise gladly eaten it all myself. Thanks for dropping by! I’ve made a similar candy before – sans coconut – as part of a Greek spread. 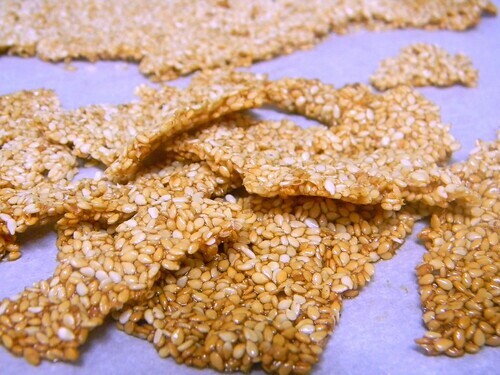 The combination of sesame seeds and honey is simply delightful! I think I’d eat three-quarters of it just standing there too! Yum! We used to eat these as kids when they came out of a packet full of glucose syrup! I’m going to make them as a special treat for Fin. This will be perfect to make and share for the Chinese New Year!!! Aren’t sesame seeds good luck? Just wrap them up in red and gold. Perfect gift and yummy treat. Yum! Would these work with raw black sesame seeds? Hi M, black sesame seeds would work. It would be a neat variation to try! Good luck! Not sure what I did wrong but these were impossible to get off the parchment paper! They smell and look amazing but they are stuck! HELP! Hi Hayley, I’m not sure what could have happened. I use parchment paper all the time and have never had anything stick to it. I had the same thing happen to me…tried a second batch on lower heat and everything was still glued to the paper. Had to toss them both.